Everything went as planned during Monica’s pregnancy and she and her husband were excited for the birth of their daughter. But when Rose was born in January 2018, she was having issues with feeding and wasn’t gaining weight. She stayed at 7 pounds for about a month. 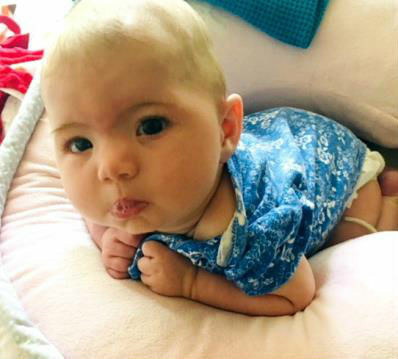 At 5 weeks old she had an 8-day hospital stay at St. Charles in Bend. After an MRI, it was determined that little Rose has a unique brain disorder: Partial Agenesis of the Corpus Callosum (PACC). Subtle anomalies to her Corpus Callosum, the nerve highway that connects the two sides of the brain, were causing Rose to have low muscle tone. She is unable to eat orally and has been fed via feeding tube since February. Rose is a little champion and recently had a surgery to place a more permanent feeding tube. She is now gaining weight consistently and starting to meet developmental milestones. She is still battling a reflux issue and throws up her food up to twelve times a day. Doctors are trying to figure out why this happens and if medication will help. Surgery would be the last option. Rose is farsighted and wears tiny little pink glasses. Time will tell what developmental challenges she will face. Delays may range from very subtle to highly significant. For now, she goes to her many therapy appointments. Feeding therapy and physical therapy are helping her. Mom had to quit her job to take care of Rose full time, so it’s been tough on their family finances. Rose is such a sweet little girl and brings so much joy to her family. She’s very expressive with her eyes and quite interactive in her own way. She’s very sweet and snuggly and her big brother Austin says she is, “cute”. Sparrow Cash raised for Rose will help with ongoing medical expenses, including all her therapy visits, and travel to doctor appointments in Portland. Students at Highland Magnet School will “earn” Sparrow Cash by completing a minimum of 256 hours of sponsored community service.